But enough about the man himself, what about the music? What about God Save The King? I am glad you asked my friends. This is far and wide his best album. Copywrite has always been a great lyricist and come with exceptional punchlines but this time his content is more introspective and powerful. He has blended his lyrical talent with his new found understanding of life perfectly on this album. My two favorite tracks are actually back to back joints on the album. Man Made and J.O.Y. both are musically excellent. They have everything that I love and something I haven’t heard very much in independent hip hop albums: A soulful male voice. Jason Rose provides that forgotten element on both of these songs, making both of the them the sure shot. And those bars and flows just don’t stop there. Copywrite continues to acrobatically flip lines on J.O.Y. but this joint features that more introspective Copywrite. In his verse you hear from a man who lost his parents but also a man who understands how he has helped others through his music. He recognizes his place in the world. Torae also lends his lyricism to the track and is definitely an asset. Copywrte, however, is the show stopper. G$K features production from Stu Bangas. The beat work is indeed stalwart. The vocal samples laced throughout and the scratching in of some Run DMC make this track special. Copywrite once again dazzles on the mic leaving the beat littered with ill punchlines and a sick flow. You also have Jason Rose, tying together all of these elements together with his vocals on the chorus. God Save The King is definitely the album that leaves the biggest impression in Copywrite’s discography, It is his most complete album. Sure it has a lot of dope guests, but that’s not what separates the album from the rest. If anything, I think the dopest addition to this album is Jason Rose. His vocals lend an appeal that the other albums just didn’t have. As a matter of fact, very few albums period have that kind of appeal. 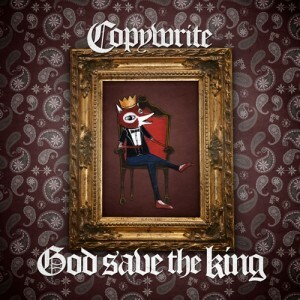 But Copywrite also has done his best work, diversifying his music and his lyrics to give us something new and even. It’s not too emotional, but it does evoke emotion. It’s not too reliant on punchlines, but it will have you hit the rewind button. It’s a very well rounded album that is going to be in some serious rotation throughout the year.